Banners do not have to be hung. Think about using other display methods for a fresh take on traditional banners. 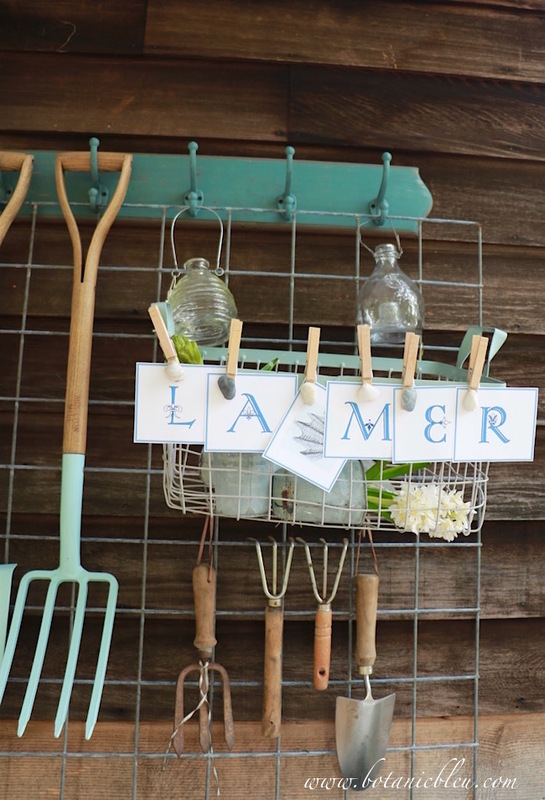 While this banner is clipped to a photo display with room for eight images on the same stand, a set of individual photo holders on stands can be grouped to spell out a banner's message. 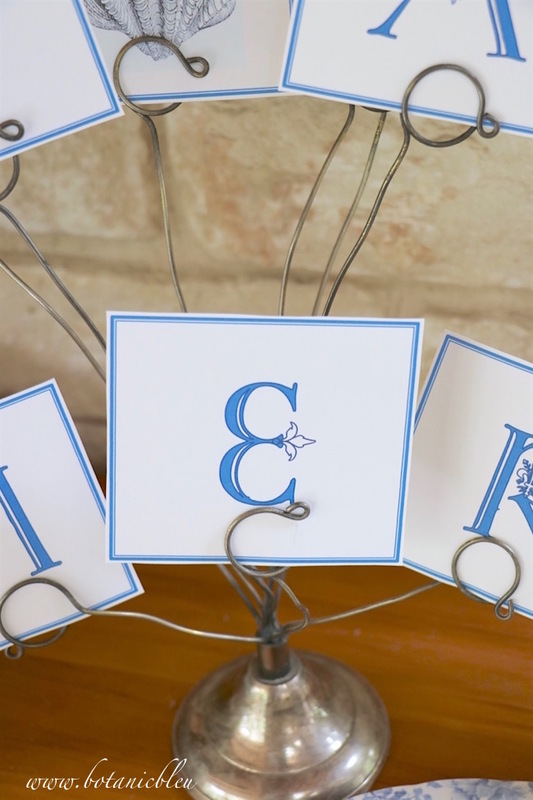 For an interesting arrangement, stagger their placement so the letters are not in a straight line, but with some letters a little in front of the others and at various angles. The framed print of Château de Chenonceau is a postcard on high-quality paper found in a papeterie (stationery store) located in the shopping arcade in the Louvre. Nice postcards are not just for mailing home to friends and family. 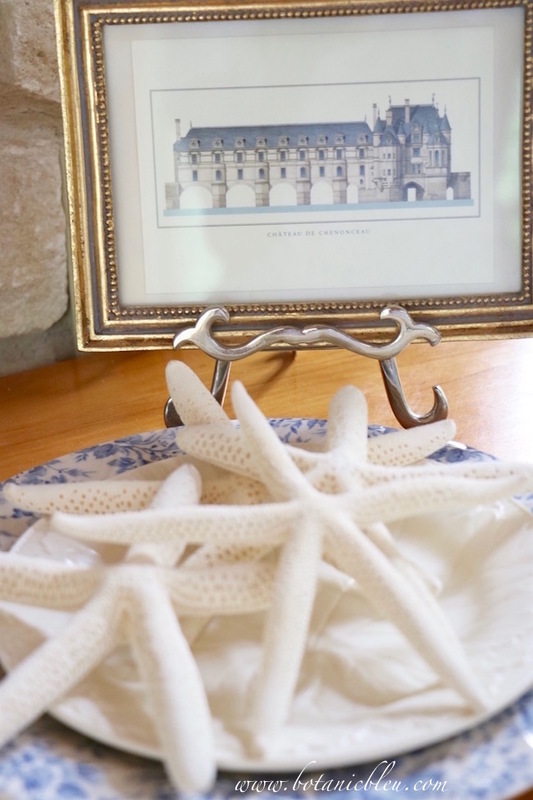 The blue and white colors go with the idea of the sea, and the beautiful French castle goes with the French words in the banner. 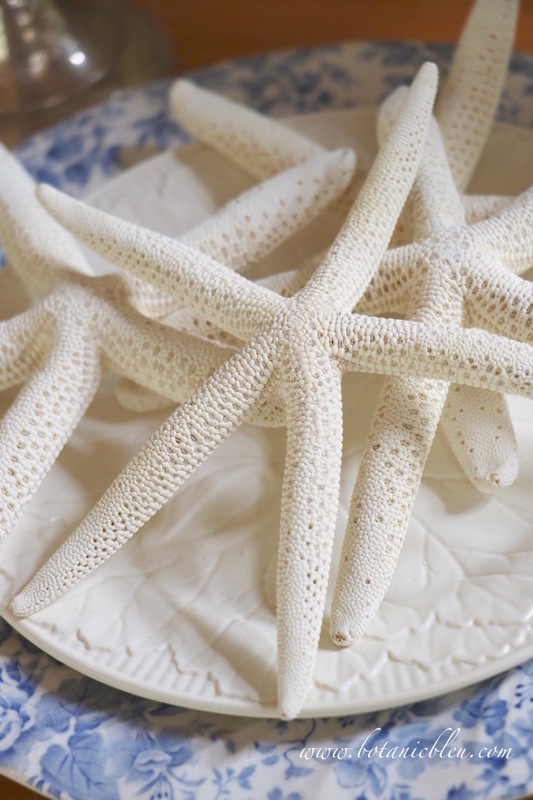 White starfish displayed on a white salad plate atop a blue floral dinner plate add texture and a real touch of the sea. 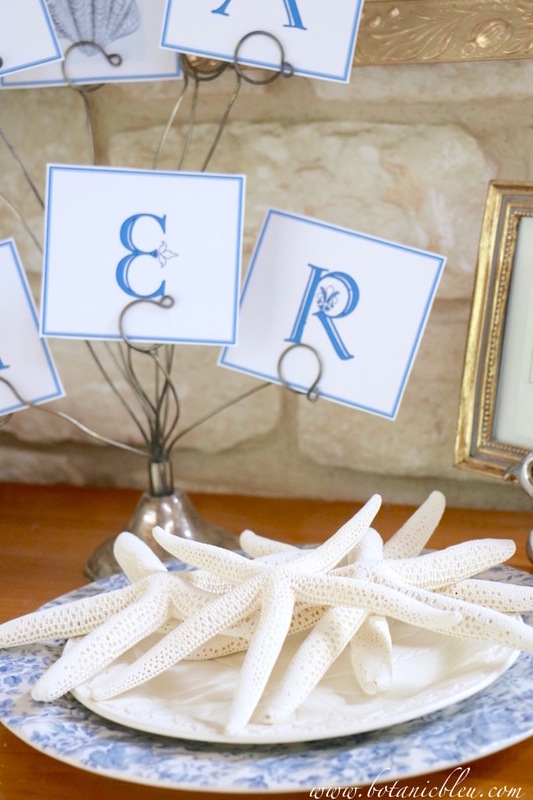 A collection of small seashells or one large seashell are other ideas for adding a bit of coastal to your French banner arrangement. Clothespins make sturdy clips to attach the banner's letters to a wire basket. If the banner is paper, use in a setting protected from the weather. Get the letters laminated at an office supply store to make them more weather proof. 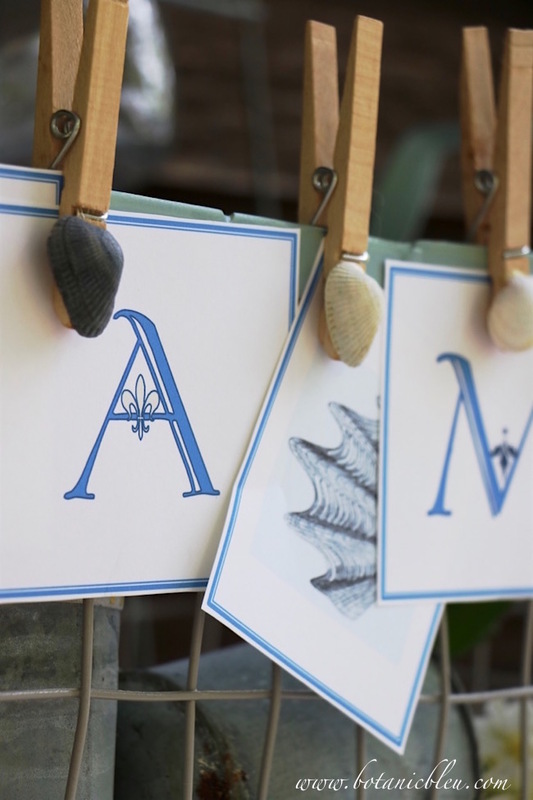 Use a shell print to separate the two words when space is tight and there is not enough room to leave a large gap between the words. Offsetting the shell print at an angle draws attention to the end of one word and the beginning of the next. There is no confusion about what the banner spells out. 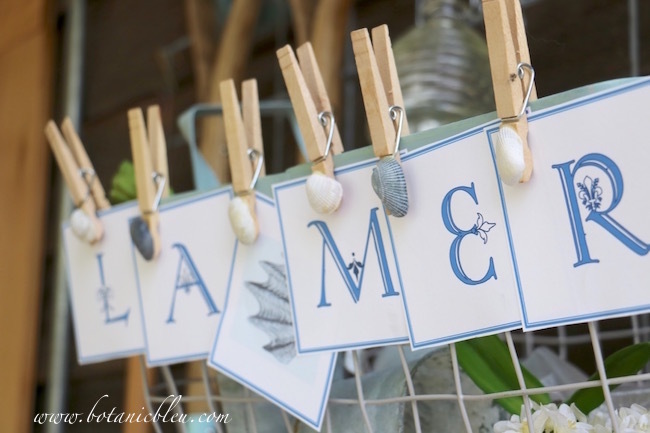 Special additions to the letters and clothespins add even more French style and coastal style to the banner. Each letter is embellished with a different fleur de lis, symbol of French royalty through the ages. The blue color in this photo is the best view of the actual color of blue on the banner. Color in photos is affected by lighting, the camera, the computer, and the printer. Each clothespin has a small seashell that was washed ashore and collected in walks along the beach. 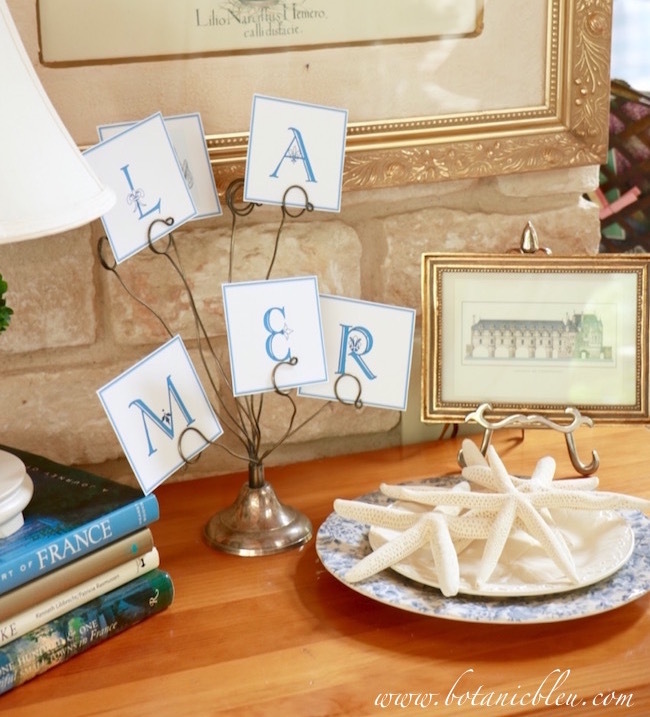 The French coastal banner can also be hung from a ribbon, twine, or wire for a more traditional banner. Later this week, I will post directions for making DIY Shell Clothespins. They are easy to make, and every day I think of another way to use them. 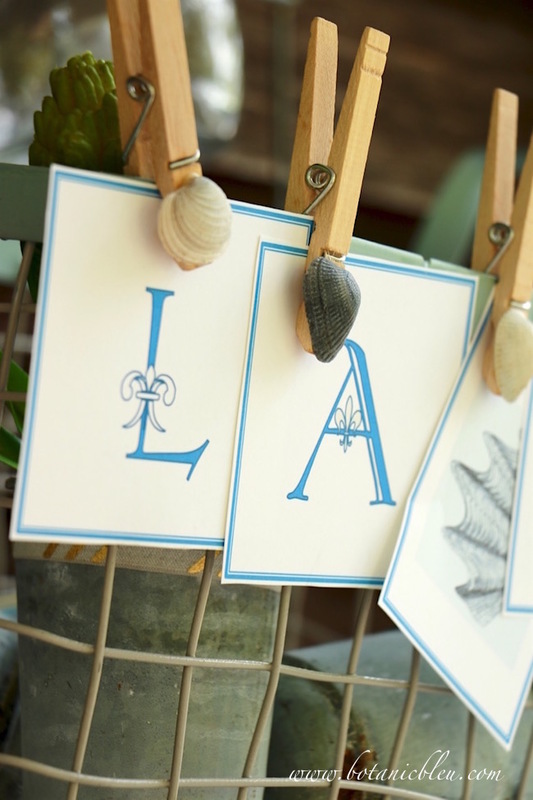 If you would like a French coastal banner at your house, download the free printable and print on white card stock. There are two sizes for the letters. The smaller size is nice for a table centerpiece or at each place setting. The larger size is the one shown in the indoor and outdoor banners. Thanks to The Graphics Fairy for the copyright free shell image. French Coastal Banner for personal use only. Summer Coastal Country Tablesetting where I combined coastal with country beginning with a vintage canning jar. 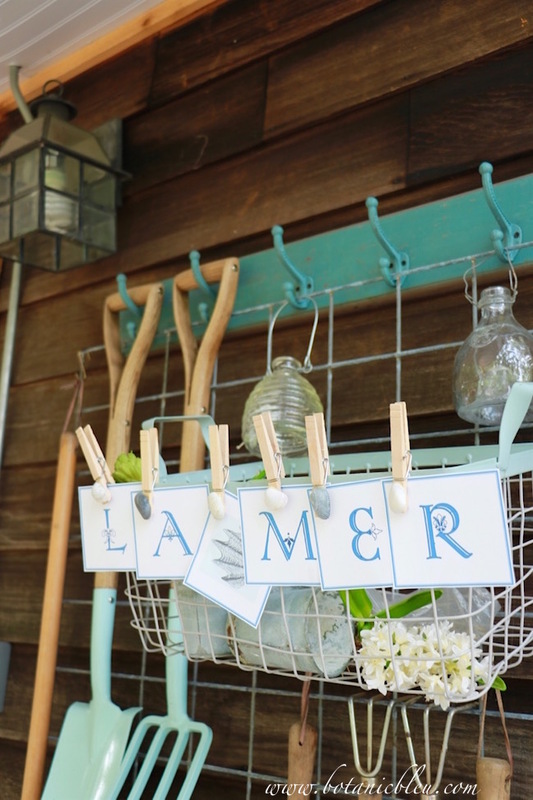 Create a Potting Bench in Coastal Colors shows how I created the back porch potting bench area this spring. This looks awesome. 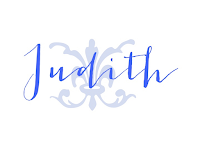 Great job Judith :) Keep sharing creative ideas! 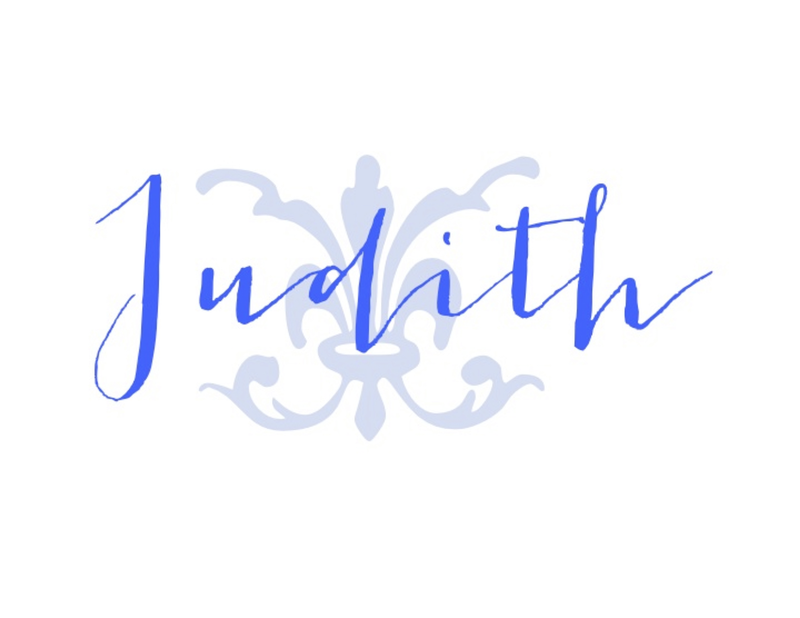 Ohh, that's just so cute, Judith! You're styling is so simple and classy!